Biotene Dry Mouth Relief Mouthwash is an oral rinse with a soothing, gentle feel that helps clean, refresh, relieves a dry mouth and soothes oral tissues. Biotene contains moisturisers to help relieve mouth dryness. Biotene Dry Mouth Relief Mouthwash is specially formulated to provide immediate dry mouth relief that lasts for up to 4 hours* while it freshens your breath. A dry mouth occurs when your mouth does not produce enough saliva to stay moist. Having a dry mouth is more than just uncomfortable. It can impact your overall oral health environment. 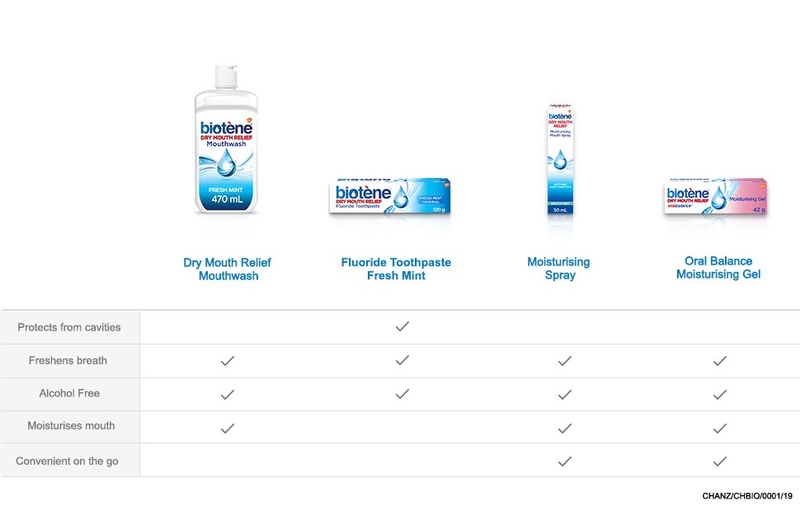 Biotene Moisturising Gels, Mouthwash and Mouth Sprays are specially formulated to help relieve the signs of a dry mouth, often caused by medication use. When used as part of your daily oral health care routine, it is an ideal oral rinse for managing your dry mouth. Biotene Mouthwash contains a mouth-moisturising system to provide soothing relief. It's gentle, alcohol-free formula refreshes your mouth, keeping it clean, and helps maintain a healthy oral environment. Biotene Dry Mouth Relief Mouthwash Fresh Mint 470mL is rated 4.7 out of 5 by 11.